The colors and scheme of the "Gitmo Mack" are (were) the same as used by Cuba's largest transit operator, Cooperativa de Omnibus Aliados (Allied Bus Cooperative). They operated primarily in Havana and had some pseudo suburban runs and several intercity routes. They could have provided service to the base area. However, by 1961-1962 they no longer existed (nor their color scheme) as they were confiscated by the new government. 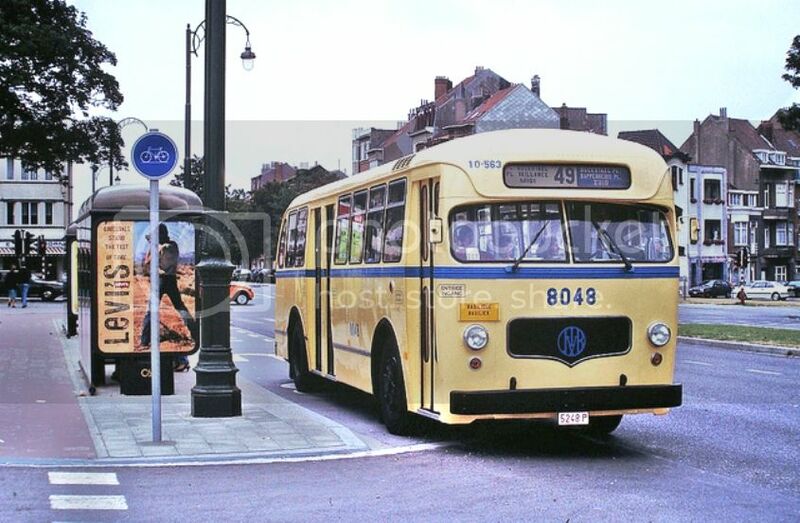 It's off to Brussels Belgium where, at sometime in the nineties, we see fleet # 8048 that is said to be a Mack/Brossel Model 'BX' operating for STIB/MIVB, a public transport company and ambling along route # 49 between Bockstael Railway Station and Brussels South Station. There is no question that both the front and rear clips are of pure Mack heritage but the passenger window treatment is very much reminiscent of ACF's post war 'C' series transits - the design of which was of European derivation originally. 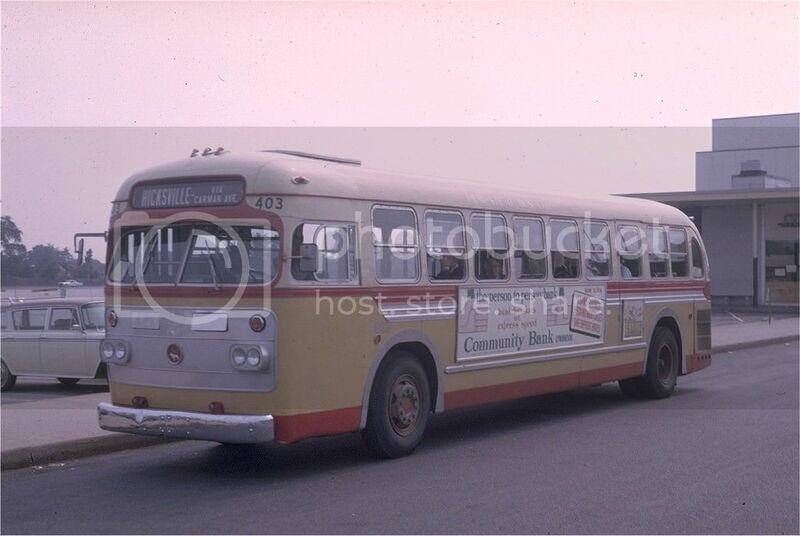 Since no photos of like buses have been found thus far, I suspect that #8048 may have been purchased used and rebuilt as noted by the add on tail lights and the sheet metal pieces that they are affixed to. Also note that there are no hinges for what was originally an emergency door, that passenger windows appear to be sealed other than the transoms and that the double stream rear doors have been divided very interestingly. I don't rule out the possibility that Mack entered a licensing agreement with Brossel (a long time Belgium bus builder) just as they did when they provided two prototype right hand drive C-50's to Stockholm, Sweden. 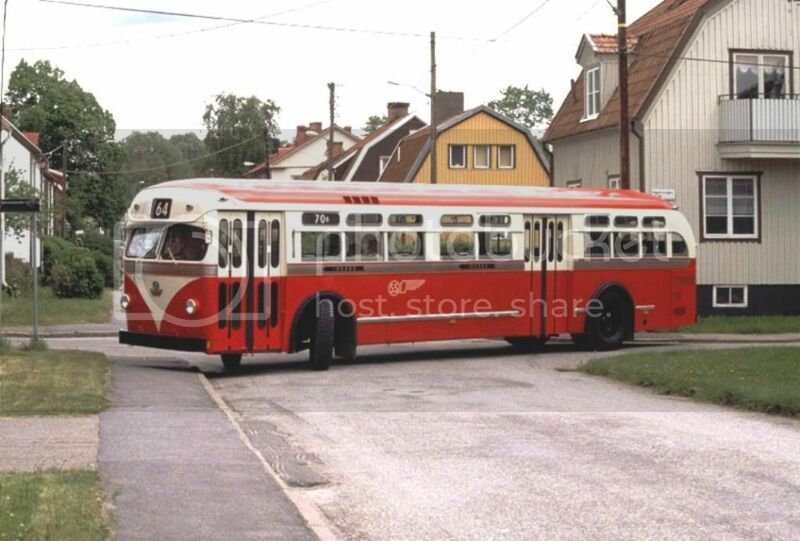 The first of the two bottom Swedish photos shows one of the C-50's mentioned furnished with the special destination sign, and the second shows a Swedish copy with passenger windows much like the Brussels job. Most of what I have deduced concerning # 8048 is highly speculative and any added information would be appreciated. Upper photos courtesy of Flickr and taken by 'brossel8260'. Lower photos also courtesy of Flickr. Mr. L.: Regarding the Brussels Macks, those windows were also used here in the U.S., albeit a rare feature. About the only difference is the location of the horizontal dividers. Note the same quarter window at the rear. Suburban windows used on Macks usually don't have rounded corners. 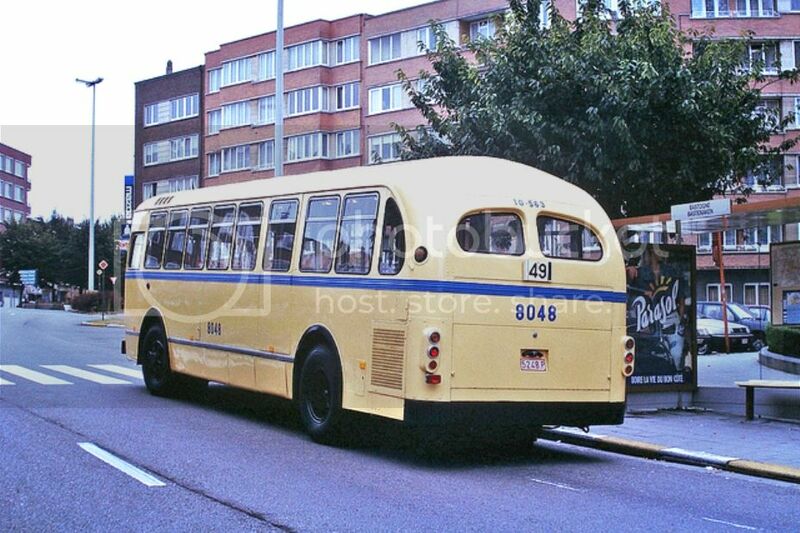 Hempstead Bus 403, a C47 model was one of them. I remember this example very well as this was the one the Mineola Police Boys Club chartered to take us kids to a trip to Yankee Stadium back in the early '60's. I believe this was the only one of this type that Hempstead had on their property, but I can be wrong. I do know that it has air suspension. What is also an oddity was the redesigned front clip. How many Macks manufactured with these clips are unknown. To Mack's credit, I do like these clips. They're very attractive IMHO. It takes away the blandness from the original Macks, yet it's not as radical at the Niagara design. Ave B & E. Broadway's 503 was another Mack with the so called "Brussels" windows. In the second photo, 503 is seen behind 505. 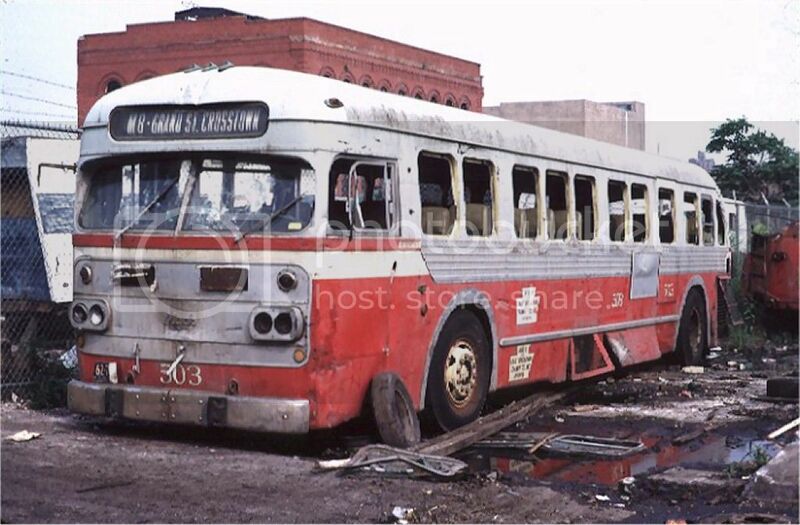 The last photo shows 503 rusting in peace. Note also the redesigned front clip. We're at the New York City Transit Authority's Coney Island Yards in Brooklyn where we see fleet # 403 - a 1954 Mack Model 'FCD Type II' operating as a Rail Diagnostics Car for the Sperry Rail Service Corporation of Danbury, Connecticut. Built from C-50 bus stock, #403 (then New Haven # eighteen) and its ilk were part of a ten rail passenger car order for the New York New Haven and Hartford Railroad. 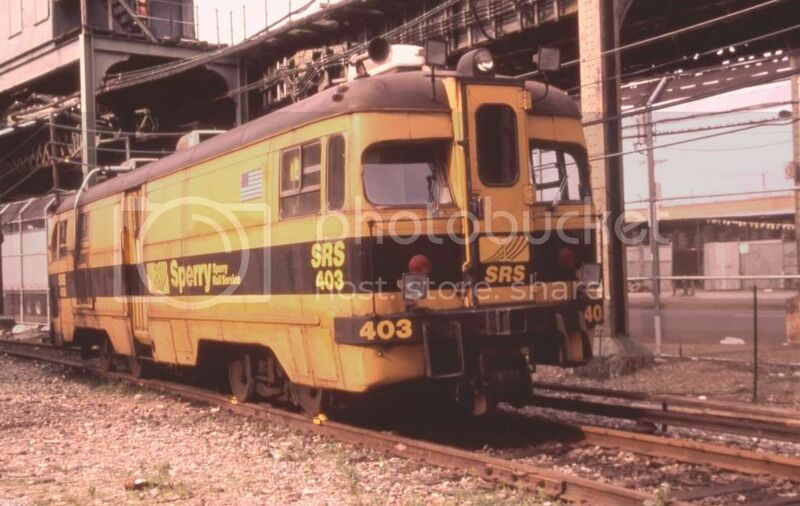 In 1958, #403 and sibling #402 (then New Haven # nineteen) were sold to Sperry and were extensively rebuilt to accommodate an array of special equipment designed to scientifically inspect rail and rail bed conditions - unfortunately, #402 was destroyed by fire in Canada early on. #15 of the original New Haven order still survives and, after a fruitful life with the railroad, went on to serve both the Remington Arms Corporation and Sperry and is now in the process of restoration to its as-built configuration by the Danbury Railway Museum in Connecticut. #10 of the original New Haven order is seen in the lower frame posing at the Mack factory when new. In May 1951, Frederick C. Dumaine, Jr. succeeded his father as president of the New Haven Railroad. Despite a dramatic post-WWII decline in passenger business, his plan included adding passenger runs on lightly-used branch lines. His reasoning was that capital should never sit idle when it could be producing revenue. If the rail was in place, the New Haven would "run as many trains as it could cram onto the tracks", according to Dumaine. To control costs on lines where passenger loads would be small, he returned to an idea the New Haven first tried in the 1920s, a bus on rails. 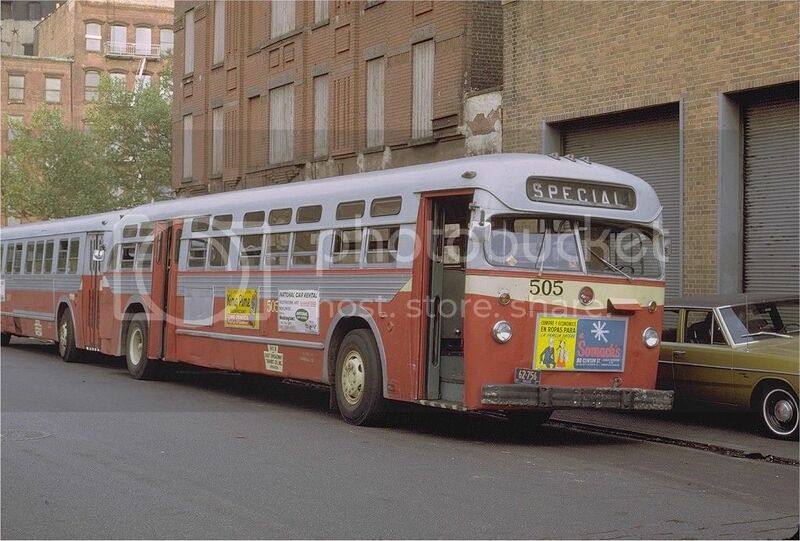 To build it, the New Haven turned to the experienced bus building firm of Mack in Allentown, Pennsylvania. 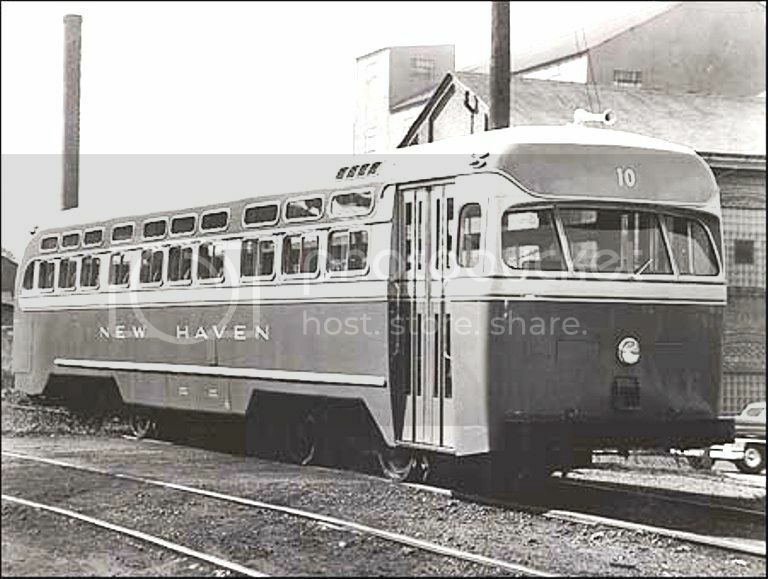 After tests with a prototype vehicle in 1952, the New Haven ordered nine modified rail buses for delivery in 1954. All 10 (including the prototype) were dubbed FCDs in honor of Frederick C. Dumaine, Sr., who had conceived the project. They were 170-horsepower diesel-electrics with a traction motor on each of their four axles and a coupler at one end so two FCDs could be M.U. 'd nose to nose to carry up to 98 passengers. Photo courtesy of 'cva58' and is available at eBay as item # 121241126358. Historic information thanks to the Danbury Museum. Sperry ran a lot of strange equipment, mostly modified from used self-propelled rail cars. Nothing special in the modern era. All truck bodies on railroad wheels. Sperry has a long history in the rail inspection business which they developed and which became a world wide operation. Very interest additional information on Mack's FCD's - it actually completes their whole story! Please feel free to PM me if you have any specific questions. I had visited this museum in 2012 and I thought it was outstanding (and it's actually free). I also visited the Mack Museum some years ago and found it to be an excellent source for my research. Requests for specific photos from their archive, which includes an 8X11 image of one dressed sample of every order ever received, are gladly duplicated with only a small donation asked for to keep the museum afloat. I befriended Museum Curator Don Schumaker who has been of great help to me over the years. Two brief comments on the railbus topic. Since they ran on Clark B-2 trucks they are technically quasi PCCs, and Sperry equipment only inspects rail and rail joints for internal defects, they do not inspect other track components or the sub grade. A technically quasi PCC. I like that description! Quick story. When I drove taxi in Lebanon,PA, the dispatcher gave me a call. Said there was a guy at 16th and Willow Sts in a yellow car that looks something like a passenger car on the siding behind the NS building. I told him ok must be a Sperry car there. When the guy got in I told him he could have just said at the Sperry car. He said I was the first cab driver he ever got that knew what it was. As was the case with Twin Coach, Mack did not show much interest in building intercity coaches with only rare exceptions for their established heavy duty transit customers and, even then, such oddities were completed in house. One glaring exception to the rule is seen below in the guise of fleet # 1684 - a 1937 39 passenger Model 6CT-3S and one of 10 likenesses numbered 1680 to 1689 delivered to Pacific Electric's (PE) Motor Transit Lines affiliate in May of that year. 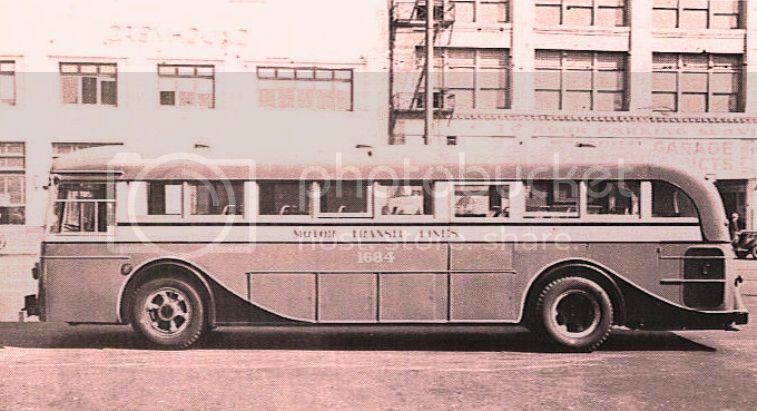 Only basic framing, chassis and front and rear clips were shipped from Mack directly to Crown Motor Carriage Works (later known as Crown Coach) in Los Angeles to produce suburban bodies including uncommon transit style seats on platforms, overhead parcel racks, underfloor luggage compartments and, an again uncommon, air operated transit style bi-fold door. Unlike their underpowered transit style cousins, these CT's boasted beefed up engines and gear ratios to meet the riggers of the Golden State's rough terrain. And carrying PE's readily identifiable red and cream color scheme, were seen mostly on the Whittier Boulevard line. This is definitely a Mack C-50 bus model. However, it did not get to Cuba from New York City but rather from Miami. 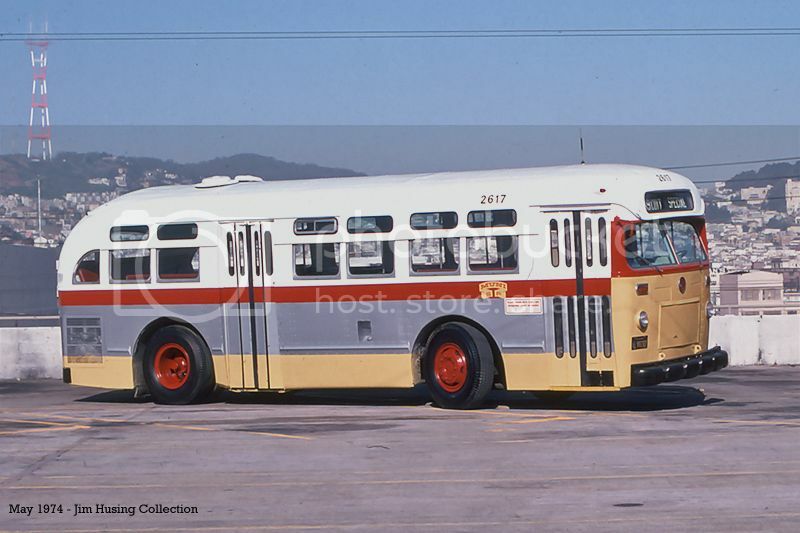 During March-April 1955 Miami Transit offered a series of gasoline powered and unpopular bus models for sale in order to make way for the large fleet of brand new GM TDH-5106s. Therefore, by deductive reasoning, the bus pictured here is one from Miami since NYCTA did not begin to discard their C-50s till after 1960s. The first 20 C-50s intended for New York City were diverted (by Mack) to Miami. These 20 buses were built to New York City specifications. 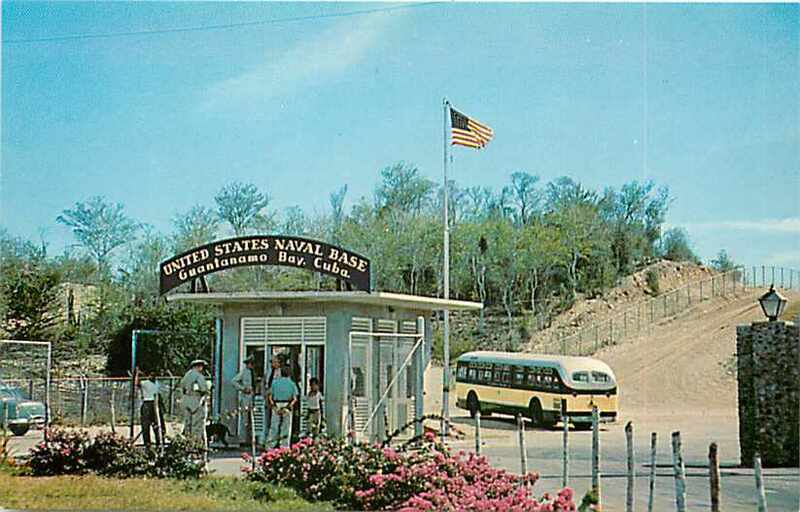 This bus either provided service through the Guantanamo Naval Base gates or to the gates from the neighboring city of Guantanamo. Perhaps the mystery is now solved!